Not to be confused with Iridescence, Structural coloration, or Phosphorescence. Male and female of the species Lampyris noctiluca mating. The female of this species has no wings, she's a larviforme, unlike the male species. Bioluminescence is the production and emission of light by a living organism. It is a form of chemiluminescence. Bioluminescence occurs widely in marine vertebrates and invertebrates, as well as in some fungi, microorganisms including some bioluminescent bacteria and terrestrial invertebrates such as fireflies. In some animals, the light is bacteriogenic, produced by symbiotic organisms such as Vibrio bacteria; in others, it is autogenic, produced by the animals themselves. In a general sense, the principal chemical reaction in bioluminescence involves some light-emitting molecule and an enzyme, generally called the luciferin and the luciferase, respectively. Because these are generic names, the luciferins and luciferases are often distinguished by including the species or group, i.e. Firefly luciferin. In all characterized cases, the enzyme catalyzes the oxidation of the luciferin. In some species, the luciferase requires other cofactors, such as calcium or magnesium ions, and sometimes also the energy-carrying molecule adenosine triphosphate (ATP). In evolution, luciferins vary little: one in particular, coelenterazine, is found in eleven different animal (phyla), though in some of these, the animals obtain it through their diet. Conversely, luciferases vary widely between different species, and consequently bioluminescence has arisen over forty times in evolutionary history. Before the development of the safety lamp for use in coal mines, dried fish skins were used in Britain and Europe as a weak source of light. This experimental form of illumination avoided the necessity of using candles which risked sparking explosions of firedamp. Another safe source of illumination in mines was bottles containing fireflies. In 1920, the American zoologist E. Newton Harvey published a monograph, The Nature of Animal Light, summarizing early work on bioluminescence. Harvey notes that Aristotle mentions light produced by dead fish and flesh, and that both Aristotle and Pliny the Elder (in his Natural History) mention light from damp wood. He also records that Robert Boyle experimented on these light sources, and showed that both they and the glow-worm require air for light to be produced. Harvey notes that in 1753, J. Baker identified the flagellate Noctiluca "as a luminous animal" "just visible to the naked eye", and in 1854 Johann Florian Heller (1813–1871) identified strands (hyphae) of fungi as the source of light in dead wood. The French pharmacologist Raphaël Dubois carried out work on bioluminescence in the late nineteenth century. He studied click beetles (Pyrophorus) and the marine bivalve mollusc Pholas dactylus. He refuted the old idea that bioluminescence came from phosphorus,[a] and demonstrated that the process was related to the oxidation of a specific compound, which he named luciferin, by an enzyme. He sent Harvey siphons from the mollusc preserved in sugar. Harvey had become interested in bioluminescence as a result of visiting the South Pacific and Japan and observing phosphorescent organisms there. He studied the phenomenon for many years. His research aimed to demonstrate that luciferin, and the enzymes that act on it is to produce light, were interchangeable between species, showing that all bioluminescent organisms had a common ancestor. However, he found this hypothesis to be false, with different organisms having major differences in the composition of their light-producing proteins. He spent the next thirty years purifying and studying the components, but it fell to the young Japanese chemist Osamu Shimomura to be the first to obtain crystalline luciferin. He used the sea firefly Vargula hilgendorfii, but it was another ten years before he discovered the chemical's structure and was able to publish his 1957 paper Crystalline Cypridina Luciferin. More recently, Martin Chalfie, Osamu Shimomura and Roger Y. Tsien won the 2008 Nobel Prize in Chemistry for their 1961 discovery and development of green fluorescent protein as a tool for biological research. Harvey wrote a detailed historical account on all forms of luminescence in 1957. An updated book on bioluminescence covering also the twentieth and early twenty-first century was published recently. In 2016, deep sea bioluminescent corals were captured for the first time in color HD Video. E. N. Harvey (1932) was among the first to propose how bioluminescence could have evolved. In this early paper, he suggested that proto-bioluminescence could have arisen from respiratory chain proteins that hold fluorescent groups. This hypothesis has since been disproven, but it did lead to considerable interest in the origins of the phenomenon. Today, the two prevailing hypotheses (both concerning marine bioluminescence) are the ones put forth by Seliger (1993) and Rees et al. (1998). Seliger's theory identifies luciferase enzymes as the catalyst for the evolution of bioluminescent systems. It suggests that the original purpose of luciferases was as mixed-function oxygenases. As the early ancestors of many species moved into deeper and darker waters natural selection applied forces that favored the development of increased eye sensitivity and enhanced visual signals. If selection were to favor a mutation in the oxygenase enzyme required for the breakdown of pigment molecules (molecules often associated with spots used to attract a mate or distract a predator) it could have eventually resulted in external luminescence in tissues. Rees et al. (1998) uses evidence gathered from the marine luciferin coelenterazine to suggest that selection acting on luciferins may have arisen from pressures to protect oceanic organisms from potentially deleterious reactive oxygen species (ROS) (e.g. H2O2 and O2− ). The functional shift from antioxidation to bioluminescence probably occurred when the strength of selection for antioxidation defense decreased as early species moved further down the water column. At greater depths exposure to ROS is significantly lower, as is the endogenous production of ROS through metabolism. While popular at first, Seliger's theory has been challenged, particularly on the biochemical and genetic evidence that Rees examines. What remains clear, however, is that bioluminescence has evolved independently at least 40 times. Bioluminescence in fish began at least by the Cretaceous period. About 1,500 fish species are known to be bioluminescent; the capability evolved independently at least 27 times. Of these 27 occasions, 17 involved the taking up of bioluminous bacteria from the surrounding water while in the others, the intrinsic light evolved through chemical synthesis. These fish have become surprisingly diverse in the deep ocean and control their light with the help of their nervous system, using it not just to lure prey or hide from predators, but also for communication. All bioluminescent organism have one thing in common. A "luciferin" and oxygen is always catalyzed by luciferase to light. McElroy and Seliger proposed 1962 that the bioluminescent reaction evolved to detoxify oxygen. So bioluminescence evolved parallel with photosynthetic organism. Today bioluminescence has other purposes. 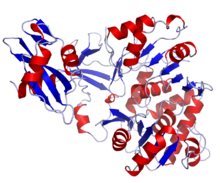 Protein structure of the luciferase of the firefly Photinus pyralis. The enzyme is a much larger molecule than luciferin. Instead of a luciferase, the jellyfish Aequorea victoria makes use of another type of protein called a photoprotein, in this case specifically aequorin. When calcium ions are added, the rapid catalysis creates a brief flash quite unlike the prolonged glow produced by luciferase. In a second, much slower, step luciferin is regenerated from the oxidised (oxyluciferin) form, allowing it to recombine with aequorin, in readiness for a subsequent flash. Photoproteins are thus enzymes, but with unusual reaction kinetics. Furthermore, some of the blue light released by aequorin in contact with calcium ions is absorbed by a green fluorescent protein, which in turn releases green light in a process called resonant energy transfer. Overall, bioluminescence has arisen over forty times in evolutionary history. In evolution, luciferins tend to vary little: one in particular, coelenterazine, is the light emitting pigment for nine phyla (groups of very different organisms), including polycystine radiolaria, Cercozoa (Phaeodaria), protozoa, comb jellies, cnidaria including jellyfish and corals, crustaceans, molluscs, arrow worms and vertebrates (ray-finned fish). Not all these organisms synthesize coelenterazine: some of them obtain it through their diet. Conversely, luciferase enzymes vary widely and tend to be different in each species. Bioluminescence occurs widely among animals, especially in the open sea, including fish, jellyfish, comb jellies, crustaceans, and cephalopod molluscs; in some fungi and bacteria; and in various terrestrial invertebrates including insects. 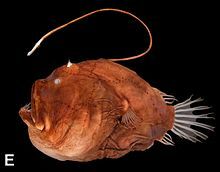 About 76% of the main taxa of deep-sea animals produce light. Most marine light-emission is in the blue and green light spectrum. However, some loose-jawed fish emit red and infrared light, and the genus Tomopteris emits yellow light. Bioluminescence has several functions in different taxa. Steven Haddock et al. (2010) list as more or less definite functions in marine organisms the following: defensive functions of startle, counterillumination (camouflage), misdirection (smoke screen), distractive body parts, burglar alarm (making predators easier for higher predators to see), and warning to deter settlers; offensive functions of lure, stun or confuse prey, illuminate prey, and mate attraction/recognition. It is much easier for researchers to detect that a species is able to produce light than to analyse the chemical mechanisms or to prove what function the light serves. In some cases the function is unknown, as with species in three families of earthworm (Oligochaeta), such as Diplocardia longa where the coelomic fluid produces light when the animal moves. The following functions are reasonably well established in the named organisms. 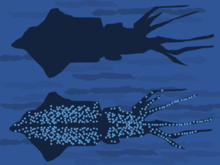 In many animals of the deep sea, including several squid species, bacterial bioluminescence is used for camouflage by counterillumination, in which the animal matches the overhead environmental light as seen from below. In these animals, photoreceptors control the illumination to match the brightness of the background. These light organs are usually separate from the tissue containing the bioluminescent bacteria. However, in one species, Euprymna scolopes, the bacteria are an integral component of the animal's light organ. In the marine environment, use of luminescence for mate attraction is chiefly known among ostracods, small shrimplike crustaceans, especially in the family Cyprididae. Pheromones may be used for long-distance communication, with bioluminescence used at close range to enable mates to "home in". A polychaete worm, the Bermuda fireworm creates a brief display, a few nights after the full moon, when the female lights up to attract males. The larvae of railroad worms (Phrixothrix) have paired photic organs on each body segment, able to glow with green light; these are thought to have a defensive purpose. They also have organs on the head which produce red light; they are the only terrestrial organisms to emit light of this colour. Aposematism is a widely used function of bioluminescence, providing a warning that the creature concerned is unpalatable. 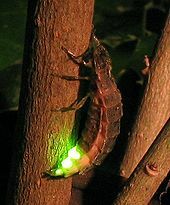 It is suggested that many firefly larvae glow to repel predators; some millipedes glow for the same purpose. Some marine organisms are believed to emit light for a similar reason. These include scale worms, jellyfish and brittle stars but further research is needed to fully establish the function of the luminescence. Such a mechanism would be of particular advantage to soft-bodied cnidarians if they were able to deter predation in this way. The limpet Latia neritoides is the only known freshwater gastropod that emits light. It produces greenish luminescent mucus which may have an anti-predator function. The marine snail Hinea brasiliana uses flashes of light, probably to deter predators. The blue-green light is emitted through the translucent shell, which functions as an efficient diffuser of light. Pyrosomes are colonial tunicates and each zooid has a pair of luminescent organs on either side of the inlet siphon. When stimulated by light, these turn on and off, causing rhythmic flashing. No neural pathway runs between the zooids, but each responds to the light produced by other individuals, and even to light from other nearby colonies. Communication by light emission between the zooids enables coordination of colony effort, for example in swimming where each zooid provides part of the propulsive force. Bioluminescent organisms are a target for many areas of research. Luciferase systems are widely used in genetic engineering as reporter genes, each producing a different colour by fluorescence, and for biomedical research using bioluminescence imaging. For example, the firefly luciferase gene was used as early as 1986 for research using transgenic tobacco plants. Vibrio bacteria symbiose with marine invertebrates such as the Hawaiian bobtail squid (Euprymna scolopes), are key experimental models for bioluminescence. Bioluminescent activated destruction is an experimental cancer treatment. See also optogenetics which involves the use of light to control cells in living tissue, typically neurons, that have been genetically modified to express light-sensitive ion channels, and also see biophoton, a photon of non-thermal origin in the visible and ultraviolet spectrum emitted from a biological system. The structures of photophores, the light producing organs in bioluminescent organisms, are being investigated by industrial designers. Engineered bioluminescence could perhaps one day be used to reduce the need for street lighting, or for decorative purposes if it becomes possible to produce light that is both bright enough and can be sustained for long periods at a workable price. The gene that makes the tails of fireflies glow has been added to mustard plants. The plants glow faintly for an hour when touched, but a sensitive camera is needed to see the glow. University of Wisconsin–Madison is researching the use of genetically engineered bioluminescent E. coli bacteria, for use as bioluminescent bacteria in a light bulb. In 2011, Philips launched a microbial system for ambience lighting in the home. An iGEM team from Cambridge (England) has started to address the problem that luciferin is consumed in the light-producing reaction by developing a genetic biotechnology part that codes for a luciferin regenerating enzyme from the North American firefly; this enzyme "helps to strengthen and sustain light output". In 2016, Glowee, a French company started selling bioluminescent lights, targeting shop fronts and municipal street signs as their main markets. France has a law that forbids retailers and offices from illuminating their windows between 1 and 7 in the morning in order to minimise energy consumption and pollution. Glowee hoped their product would get around this ban. They used bacteria called Aliivibrio fischeri which glow in the dark, but the maximum lifetime of their product was three days. ^ Freese, Barbara (2006). Coal: A Human History. Arrow. p. 51. ISBN 978-0-09-947884-3. ^ Harvey cites this as Baker, J.: 1743–1753, The Microscope Made Easy and Employment for the Microscope. ^ Tuckey, James Hingston (May 1818). Thomson, Thomas (ed.). Narrative of the Expedition to the Zaire. Annals of Philosophy. volume XI. p. 392. Retrieved 22 April 2015. ^ a b c d Darwin, Charles (1839). Narrative of the surveying voyages of His Majesty's Ships Adventure and Beagle between the years 1826 and 1836, describing their examination of the southern shores of South America, and the Beagle's circumnavigation of the globe. Journal and remarks. 1832–1836. Henry Colburn. pp. 190–192. ^ a b c Pauly, Daniel (13 May 2004). Darwin's Fishes: An Encyclopedia of Ichthyology, Ecology, and Evolution. Cambridge University Press. pp. 15–16. ISBN 978-1-139-45181-9. ^ Shimomura, O. (August 1995). "A short story of aequorin". The Biological Bulletin. 189 (1): 1–5. doi:10.2307/1542194. JSTOR 1542194. PMID 7654844. ^ Huth, John Edward (15 May 2013). The Lost Art of Finding Our Way. Harvard University Press. p. 423. ISBN 978-0-674-07282-4. ^ "Luminescence". Encyclopædia Britannica. Retrieved 16 December 2014. ^ Poisson, Jacques (April 2010). "Raphaël Dubois, from pharmacy to bioluminescence". Rev Hist Pharm (Paris) (in French). 58 (365): 51–56. ISSN 0035-2349. PMID 20533808. ^ a b Pieribone, Vincent; Gruber, David F. (2005). Aglow in the Dark: The Revolutionary Science of Biofluorescence. Harvard University Press. pp. 35–41. ISBN 978-0-674-01921-8. ^ Harvey, E. Newton (1957). A History of Luminescence: From the Earliest Times Until 1900. Philadelphia: American Philosophical Society. ^ Anctil, Michel (2018). Luminous Creatures: The History and Science of Light Production in Living Organisms. Montreal & Kingston, London, Chicago: McGill-Queen's University Press. ISBN 978-0-7735-5312-5. ^ Fulcher, Bob. "Lovely and Dangerous Lights" (PDF). Tennessee Conservationist Magazine. Archived from the original (PDF) on 14 August 2014. Retrieved 28 November 2014. ^ Taylor, Liz (9 August 2016). "Deep Sea Bioluminescent Corals Captured for the First Time in Color HD Video". National Geographic. National Geographic. Retrieved 9 August 2016. ^ Harvey, E.N. (1932). "The evolution of bioluminescence and its relation to cell respiration". Proceedings of the American Philosophical Society. 71: 135–141. ^ a b Seliger, H.H. (1993). 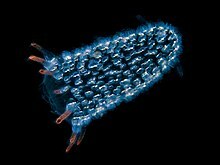 "Bioluminescence: excited states under cover of darkness". Naval Research Reviews. 45. ^ a b Rees, J. F.; et al. (1998). "The origins of marine bioluminescence: Turning oxygen defence mechanisms into deep-sea communication tools". Journal of Experimental Biology. 201: 1211–1221. ^ Widder, Edith A. (1999). Archer, S.; Djamgoz, M.B. ; Loew, E.; Partridge, J.C.; Vallerga, S. (eds.). Bioluminescence. Adaptive Mechanisms in the Ecology of Vision. Springer. pp. 555–581. ^ Haddock, S. H. D.; et al. (2010). "Bioluminescence in the Sea". Annual Review of Marine Science. 2: 443–493. Bibcode:2010ARMS....2..443H. doi:10.1146/annurev-marine-120308-081028. PMID 21141672. ^ Davis, Matthew P.; Sparks, John S.; Smith, W. Leo (June 2016). "Repeated and Widespread Evolution of Bioluminescence in Marine Fishes". PLoS ONE. 11 (6): e0155154. Bibcode:2016PLoSO..1155154D. doi:10.1371/journal.pone.0155154. PMC 4898709. PMID 27276229. ^ Yong, Ed (8 June 2016). "Surprising History of Glowing Fish". Phenomena. National Geographic. Retrieved 11 June 2016. ^ Wilson, Thérèse; Hastings, J. Woodland (1998). "Bioluminescence". Annual Review of Cell and Developmental Biology. 14 (1): 197–230. doi:10.1146/annurev.cellbio.14.1.197. PMID 9891783. ^ McElroy, William D.; Seliger, Howard H. (December 1962). "Biological Luminescence". Scientific American. 207 (6): 76–91. doi:10.1038/scientificamerican1262-76. ISSN 0036-8733. ^ a b c d e f g h i j k l m n o Haddock, Steven H.D. ; Moline, Mark A.; Case, James F. (2010). "Bioluminescence in the Sea". Annual Review of Marine Science. 2: 443–493. Bibcode:2010ARMS....2..443H. doi:10.1146/annurev-marine-120308-081028. PMID 21141672. ^ Hastings, J.W. (1983). "Biological diversity, chemical mechanisms, and the evolutionary origins of bioluminescent systems". J. Mol. Evol. 19 (5): 309–21. Bibcode:1983JMolE..19..309H. doi:10.1007/BF02101634. ISSN 1432-1432. PMID 6358519. ^ Shimomura, O.; Johnson, F.H. ; Saiga, Y. (1962). "Extraction, purification and properties of aequorin, a bioluminescent protein from the luminous hydromedusan, Aequorea". J Cell Comp Physiol. 59 (3): 223–39. doi:10.1002/jcp.1030590302. PMID 13911999. ^ Shimomura, O.; Johnson, F.H. (1975). "Regeneration of the photoprotein aequorin". Nature. 256 (5514): 236–238. Bibcode:1975Natur.256..236S. doi:10.1038/256236a0. PMID 239351. ^ Morise, H.; Shimomura, O.; Johnson, F.H. ; Winant, J. (1974). "Intermolecular energy transfer in the bioluminescent system of Aequorea". Biochemistry. 13 (12): 2656–62. doi:10.1021/bi00709a028. PMID 4151620. ^ Martini, Séverine; Haddock, Steven H. D. (April 2017). "Quantification of bioluminescence from the surface to the deep sea demonstrates its predominance as an ecological trait". Scientific Reports. 7: 45750. Bibcode:2017NatSR...745750M. doi:10.1038/srep45750. PMC 5379559. PMID 28374789. ^ Sparks, John S.; Schelly, Robert C.; Smith, W. Leo; Davis, Matthew P.; Tchernov, Dan; Pieribone, Vincent A.; Gruber, David F. (8 January 2014). "The Covert World of Fish Biofluorescence: A Phylogenetically Widespread and Phenotypically Variable Phenomenon". PLoS ONE. 9 (1): e83259. Bibcode:2014PLoSO...983259S. doi:10.1371/journal.pone.0083259. PMC 3885428. PMID 24421880. ^ Ross, Alison (27 September 2005). "'Milky seas' detected from space". BBC. Retrieved 13 March 2013. ^ a b c d e f Viviani, Vadim (17 February 2009). "Terrestrial bioluminescence". Retrieved 26 November 2014. ^ a b Young, R.E. ; Roper, C.F. (1976). "Bioluminescent countershading in midwater animals: evidence from living squid". Science. 191 (4231): 1046–8. Bibcode:1976Sci...191.1046Y. doi:10.1126/science.1251214. PMID 1251214. ^ Tong, D; Rozas, N.S. ; Oakley, T.H. ; Mitchell, J.; Colley, N.J.; McFall-Ngai, M.J. (2009). "Evidence for light perception in a bioluminescent organ". Proceedings of the National Academy of Sciences of the United States of America. 106 (24): 9836–41. Bibcode:2009PNAS..106.9836T. doi:10.1073/pnas.0904571106. PMC 2700988. PMID 19509343. ^ Meyer-Rochow, Victor Benno (2007). "Glowworms: a review of "Arachnocampa" spp and kin". Luminescence. 22 (3): 251–265. doi:10.1002/bio.955. PMID 17285566. ^ Broadley, R.; Stringer, I. (2009). "Larval behaviour of the New Zealand glowworm, Arachnocampa luminosa (Diptera: Keroplatidae), in bush and caves". In Meyer-Rochow, V.B. (ed.). Bioluminescence in Focus. Research Signpost: Kerala. pp. 325–355. ^ Shimomura, Osamu (2012). Bioluminescence: Chemical Principles and Methods. World Scientific. p. 234. ISBN 978-981-4366-08-3. ^ Viviani, Vadim R.; Bechara, Etelvino J.H. (1997). "Bioluminescence and Biological Aspects of Brazilian Railroad-Worms (Coleoptera: Phengodidae)". Annals of the Entomological Society of America. 90 (3): 389–398. doi:10.1093/aesa/90.3.389. ^ Marek, Paul; Papaj, Daniel; Yeager, Justin; Molina, Sergio; Moore, Wendy (2011). "Bioluminescent aposematism in millipedes". Current Biology. 21 (18): R680–R681. doi:10.1016/j.cub.2011.08.012. PMC 3221455. PMID 21959150. ^ Meyer-Rochow, V. B.; Moore, S. (1988). "Biology of Latia neritoides Gray 1850 (Gastropoda, Pulmonata, Basommatophora): the Only Light-producing Freshwater Snail in the World". Internationale Revue der Gesamten Hydrobiologie und Hydrographie. 73 (1): 21–42. doi:10.1002/iroh.19880730104. ^ Deheyn, Dimitri D.; Wilson, Nerida G. (2010). "Bioluminescent signals spatially amplified by wavelength-specific diffusion through the shell of a marine snail". Proceedings of the Royal Society. 278 (1715): 2112–2121. doi:10.1098/rspb.2010.2203. PMC 3107627. ^ Bowlby, Mark R.; Edith Widder; James Case (1990). "Patterns of stimulated bioluminescence in two pyrosomes (Tunicata: Pyrosomatidae)". Biological Bulletin. 179 (3): 340–350. doi:10.2307/1542326. JSTOR 1542326. PMID 29314963. ^ Encyclopedia of the Aquatic World. Marshall Cavendish. January 2004. p. 1115. ISBN 978-0-7614-7418-0. ^ Copeland, J.; Daston, M.M. (1989). "Bioluminescence in the terrestrial snail Quantula (Dyakia) striata". Malacologia. 30 (1–2): 317–324. ^ Eisner, Thomas; Goetz, Michael A.; Hill, David E.; Smedley, Scott R.; Meinwald, Jarrold (1997). 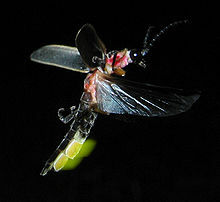 "Firefly "femmes fatales" acquire defensive steroids (lucibufagins) from their firefly prey". Proceedings of the National Academy of Sciences of the United States of America. 94 (18): 9723–9728. Bibcode:1997PNAS...94.9723E. doi:10.1073/pnas.94.18.9723. PMC 23257. PMID 9275191. ^ Greven, Hartmut; Zwanzig, Nadine (2013). "Courtship, Mating, and Organisation of the Pronotum in the Glowspot Cockroach Lucihormetica verrucosa (Brunner von Wattenwyl, 1865) (Blattodea: Blaberidae)". Entomologie Heute. 25: 77–97. ^ Merritt, David J. (2013). 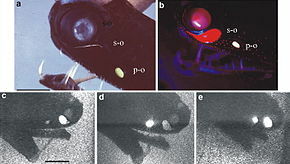 "Standards of evidence for bioluminescence in cockroaches". Naturwissenschaften. 100 (7): 697–698. Bibcode:2013NW....100..697M. doi:10.1007/s00114-013-1067-9. PMID 23740173. ^ Douglas, R.H.; Mullineaux, C.W. ; Partridge, J.C. (29 September 2000). "Long-wave sensitivity in deep-sea stomiid dragonfish with far-red bioluminescence: evidence for a dietary origin of the chlorophyll-derived retinal photosensitizer of Malacosteus niger". Philosophical Transactions of the Royal Society B. 355 (1401): 1269–1272. doi:10.1098/rstb.2000.0681. PMC 1692851. PMID 11079412. ^ Bone, Quentin; Moore, Richard (1 February 2008). Biology of Fishes. Taylor & Francis. pp. 8: 110–111. ISBN 978-1-134-18630-3. ^ Koo, J.; Kim, Y.; Kim, J.; Yeom, M.; Lee, I. C.; Nam, H. G. (2007). "A GUS/Luciferase Fusion Reporter for Plant Gene Trapping and for Assay of Promoter Activity with Luciferin-Dependent Control of the Reporter Protein Stability". Plant and Cell Physiology. 48 (8): 1121–31. doi:10.1093/pcp/pcm081. PMID 17597079. ^ Nordgren, I. K.; Tavassoli, A. (2014). "A bidirectional fluorescent two-hybrid system for monitoring protein-protein interactions". Molecular BioSystems. 10 (3): 485–490. doi:10.1039/c3mb70438f. PMID 24382456. ^ Xiong, Yan Q.; Willard, Julie; Kadurugamuwa, Jagath L.; Yu, Jun; Francis, Kevin P.; Bayer, Arnold S. (2004). "Real-Time in Vivo Bioluminescent Imaging for Evaluating the Efficacy of Antibiotics in a Rat Staphylococcus aureus Endocarditis Model". Antimicrobial Agents and Chemotherapy. 49 (1): 380–7. doi:10.1128/AAC.49.1.380-387.2005. PMC 538900. PMID 15616318. ^ Di Rocco, Giuliana; Gentile, Antonietta; Antonini, Annalisa; Truffa, Silvia; Piaggio, Giulia; Capogrossi, Maurizio C.; Toietta, Gabriele (1 September 2012). "Analysis of biodistribution and engraftment into the liver of genetically modified mesenchymal stromal cells derived from adipose tissue". Cell Transplantation. 21 (9): 1997–2008. doi:10.3727/096368911X637452. PMID 22469297. ^ Zhao, Dawen; Richer, Edmond; Antich, Peter P.; Mason, Ralph P. (2008). "Antivascular effects of combretastatin A4 phosphate in breast cancer xenograft assessed using dynamic bioluminescence imaging and confirmed by MRI". The FASEB Journal. 22 (7): 2445–51. doi:10.1096/fj.07-103713. PMC 4426986. PMID 18263704. ^ Ow, D.W.; Wood, K.V. ; DeLuca, M.; de Wet, J.R.; Helinski, D.R. ; Howell, S.H. (1986). "Transient and stable expression of the firefly luciferase gene in plant cells and transgenic plants". Science. 234 (4778). American Association for the Advancement of Science. pp. 856–856. Bibcode:1986Sci...234..856O. doi:10.1126/science.234.4778.856. ISSN 0036-8075. ^ Altura, M.A. ; Heath-Heckman, E.A. ; Gillette, A.; Kremer, N.; Krachler, A.M.; Brennan, C.; Ruby, E.G. ; Orth, K.; McFall-Ngai, M.J. (2013). "The first engagement of partners in the Euprymna scolopes-Vibrio fischeri symbiosis is a two-step process initiated by a few environmental symbiont cells". Environmental Microbiology. 15 (11): 2937–50. doi:10.1111/1462-2920.12179. PMC 3937295. PMID 23819708. ^ "Comprehensive Squid-Vibrio Publications List". University of Wisconsin-Madison. Archived from the original on 19 October 2014. ^ Cha, Bonnie (28 November 2011). "Philips Bio-light creates mood lighting with bacteria". ^ a b Marcellin, Frances (26 February 2016). "Glow-in-the-dark bacterial lights could illuminate shop windows 2016". New Scientist. ^ "Glowee: A vision of night-time lighting". EDF Pulse. Electricite de France. 2015. Retrieved 4 March 2016. ^ "Glow-in-the-dark bacterial lights could illuminate shop windows". New Scientist. 26 February 2016. Wilson, T.; Hastings, J.W. (1998). "Bioluminescence". Annual Review of Cell and Developmental Biology. 14: 197–230. doi:10.1146/annurev.cellbio.14.1.197. PMID 9891783. 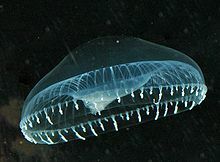 Wikimedia Commons has media related to Bioluminescence. Scholia has a topic profile for Bioluminescence.